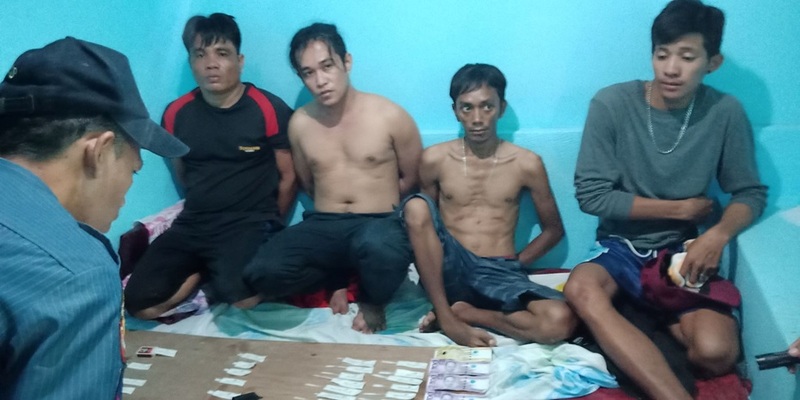 Four alleged personalities were arrested by police during an anti-illegal drug operation at an inn in Dauis town on Monday. Dauis police officers set up the drug buy-bust operation against Arnulfo Aranjuez, 33, after he was allegedly spotted selling illegal drugs at the Two Lovers’ Inn in Barangay Tinago. During the arrest, Aranjuez was caught with three companions who were allegedly in a pot session inside a rented room at the inn. Police identified the three men as Rodel Lastrilla, 27; Quinson Bunayog, 36; and David Ybanez, 18. In a report, police said that an undercover cop transacted with Aranjuez through a mobile phone but it was Lastrilla who handed over the shabu worth P500. Both Lastrilla and Aranjuez were then arrested inside the room where operatives also found Bunayog and Ybanez. Police said they found 25 more packets of suspected shabu inside the room.